®ã®ÊÄ½ çÖ-¦ÙÝ ãÊ  Ã Ý ÙØç®Ù        in evidence with some of the larger stands. Another stand of interest belonged to the St.
onto a conveyor, ranging from A5 to A4 and         member, Bob Richardson. each one being trimmed to the correct size. 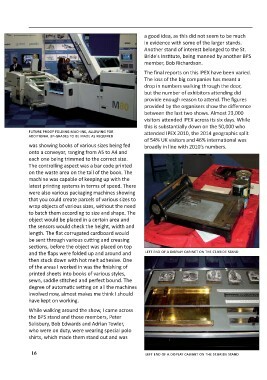 The ﬁnal reports on this IPEX have been varied. length. The ﬂat corrugated cardboard would         broadly in line with 2010’s numbers.